Mother’s Day was last weekend and spring is a wonderful time of year to celebrate mothers! During spring nature is bursting with new life. Animal mothers and babies can be found in field, forest, and stream. 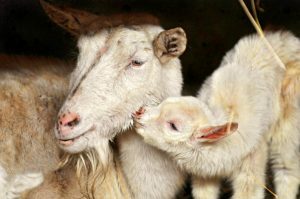 Let’s explore animal mothers and babies in celebration of mothers this week! In the classroom, ask children if they have ever seen a mother and baby together? What about an animal mother and baby? Play a match game. Gather pictures of animal babies and mothers. Match animal babies to their mothers (such as the cards that go with the “Grow As We Go” Growing Up WILD activity). Have children bring in a picture of themselves and their mother. Have children match mothers to children. Do you want to explore further? Check nature supply store for animal life cycle cards, models and stuffed animals (such as Acorn Naturalists). Follow a webcam, such as the Decorah Eagles, and watch them raise their young. Outside: Take a walk around the schoolyard or to your local park. Look for animal mothers and babies. There should be bird nests, tadpoles, and insects, among others, this time of year. When you spot an animal see if you can tell if it is a baby or a mother. Craft: When you are outside on your nature walk around the schoolyard have children collect objects to make a card for their mothers for Mother’s Day. Flower petals, leaves, pretty small pebbles etc all can be glued to cards. Or have the children collect things to makes nature necklaces for their mothers. Kindernature.org has a wide variety of activities, songs, games and crafts about all five groups of vertebrates!